The lean to is looking so much nicer since I added the hanging plants. The President recovering well after a hard pruning last year. I do like my pots as you may have noticed but in the current hot spell it does make such a lot of work especially since we have a hose pipe ban already. What's that in the Hosta bed? Hosta bed but we will ignore the ground elder in the bed behind, sigh! I decided to put two Acers in the shady corner as they were suffering from too much sun last year. Lots happening in the vegetable area. It is really strange having so much more space since the Leylandii hedge was removed - however it is rather sunny for my nursery although the Laurel are full of shoots so it won't be long before we have a decent and more easily managed hedge again. Sadly the Wisteria is struggling to grow so we decided to put another plant in, another casualty of the decorating work last year due to new windows. We really missed our beautiful flowering Wisteria this year. We decided to move the barrel and connect to the downpipe with a coat of paint I think it looks ok. There has been someone sorely missed in Orange Cottage Garden this Month. 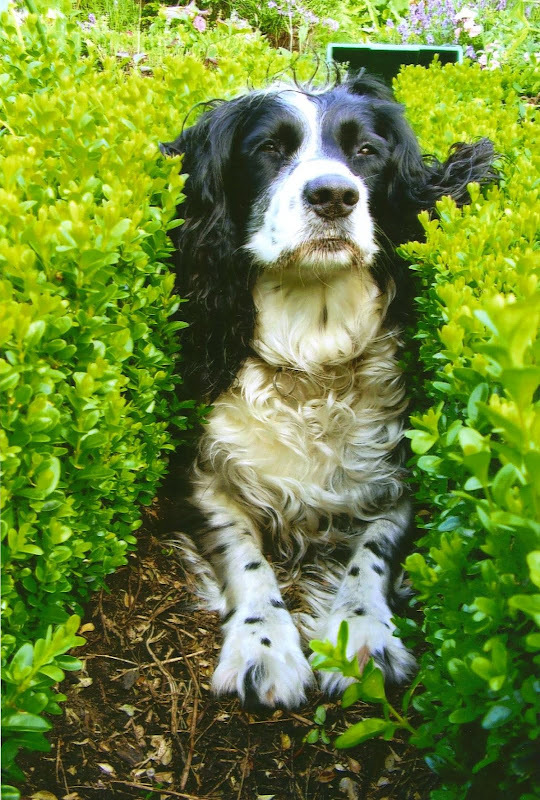 Sadly we lost our Springer Spaniel Beth. There is nothing quite like a dog as a companion in the garden or on walks in the woods and she is constantly in our thoughts as we go about our daily tasks. Monty Don wrote in his book The Irvington Diaries.